Because of the all of the “excitement” in my life, I missed the first two spinning classes. Got all caught up on Wednesday. LOVE those women. It was so nice to see everyone again, forget about spinning let’s get caught up about who did what over the summer. Our teacher, Margaret, rings a bell when she needs to have us quiet down so the newbies in the circle around her can hear. That bell went off a heck of a lot during yesterday’s class. Included are 64 help cards. From the titles of some of the cards you can see the topics covered. I have not torn the cards apart yet. For those of us who do a lot of Andean Plying, Margaret pointed out an errata on page 79. If you do Andean Plying you’ll see the problem right away. As shown, the ply around the middle finger will bend the finger backwards which will hurt. The yarn needs to be looped around the front towards the palm. That way the tension on the finger will slightly bend it in the direction your finger normally bends, towards the palm. 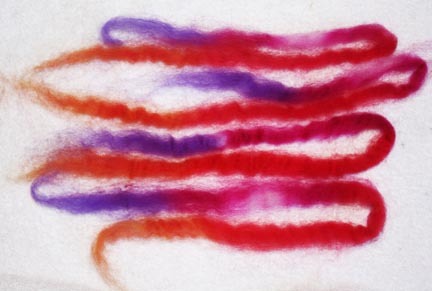 Our lesson for the week is Hawser Plying, p. 92 which is used to make elastic yarn perfect for cuffs or hat brims. Method: 1. 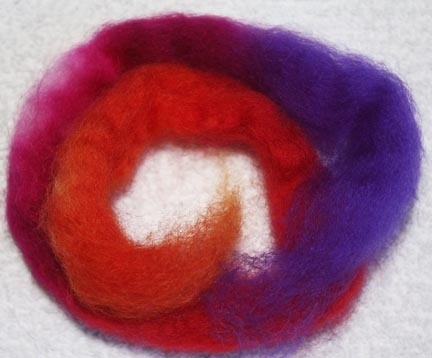 Ply two Z-spun singles together with a Z-twist. (This method uses groups of two). Be forewarned that this makes an extremely twisty yarn. 2. Ply two of the Step 1 Z-plyed together using a S-ply. This will nicely balance out the super twist giving a wonderfully elastic yarn. Caroline (sp. I can’t remember the correct, but odd, spelling of her name, sorry) had just knit cuffs onto her sweater which were all stretched out. She spun and plyed more of the yarn using the Hawser Plying method, tore out and reknitted the cuffs. Showed us in class how wonderful the new cuffs are, nice and bounce-back stretchy. I don’t make sweaters, but I do make hats. Besides making a sample, I’ll have to spin and Haswer Ply my next hat brim. ~Thank you, thank you Opal at Celebrate Life! 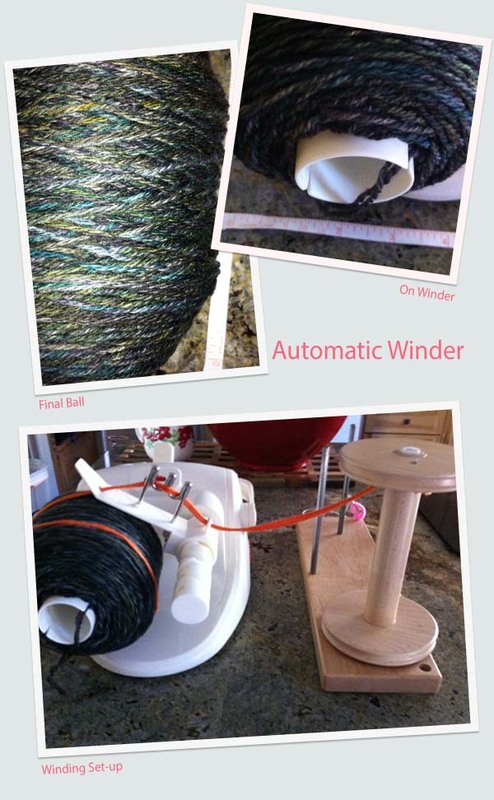 She blogged about her new Boyle automatic yarn-winder purchased at Michael’s with a 50% off coupon. Well, just so happens that I had a 50% off coupon in my hot hand. Went right to Michael’s and purchased the last one in stock. Yipee! Now what to try it out on? Hum, I didn’t have any yarn to wind at the moment. Eureka! Barb’s fingerling cone of yarn she purchased and asked if I’d ply it since she had knitted a vest with it and had held two strands together! Hours later, plying done. Check! Waiting until she came down so we could try the machine together was taxing for this “instant gratification” personality I have. (I’m working on it this year.) The results? I LOVE this machine. 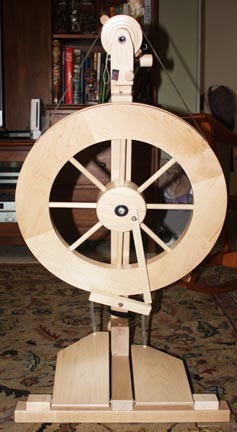 Look, I can have it wind straight from the bobbin on the Lazy Kate. Super cool! Thanks Opal! Winding straight from the bobbin. 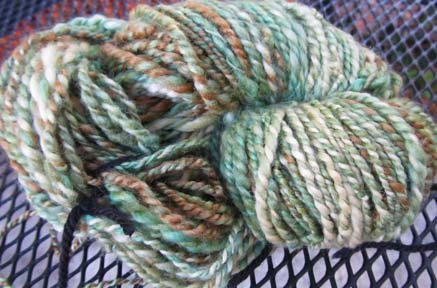 ~Here it is in all it’s glory, Adirondack has been spun and plied! I hadn’t spun in 3 months so I probably should have warmed up on something else first. Oh well…. 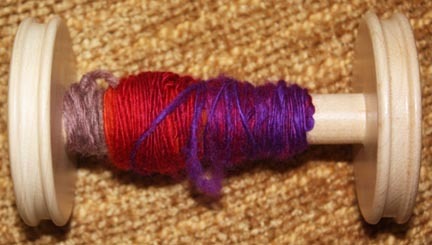 I use American Long Draw to spin and then double plied. There were 4 ounces and I never realized how tiring plying is. Yikes! I’ve ended up with about 90 yards of two-ply woolen yarn so the question becomes, what shall I knit? Curls recommended a keyhole type scarf. 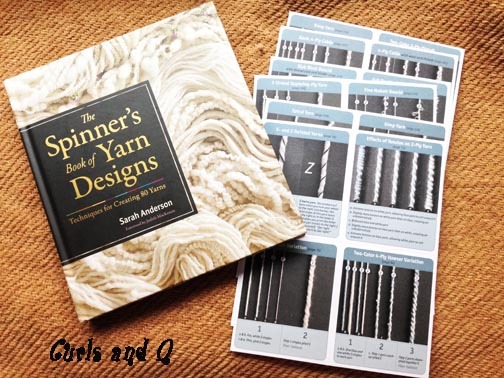 I’ve looked at some of the patterns and wonder if I have enough yarn. Some of you knitters out there, what charming items have you knitted with about 90 yards of woolen yarn? Off to spinning class today. There is so much to blog about this week! Enjoy your day and make sure to share your wonderful crafty ideas with us!